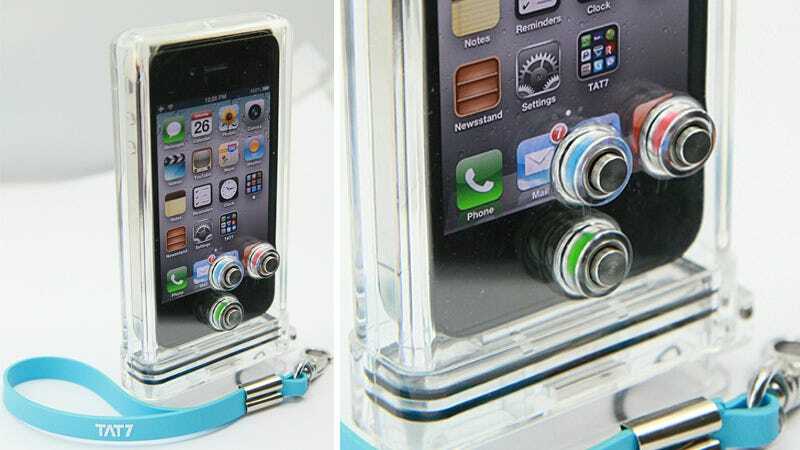 It might be waterproof to 100 feet, but TAT7's iPhone Scuba Case only includes three strategically-placed mechanical buttons for launching and operating the default camera app. So updating your Facebook profile from Davy Jones' locker isn't going to happen. The $85 case can be installed in just seconds—you literally just slide your phone in and close the door. And it includes a wrist lanyard so you won't need James Cameron's help if you drop it. Its three waterproof mechanical buttons look like they're positioned to operate the home button, launch apps located in the lower right corner of the screen, and operate the camera app's shutter button and photo/video switch. But that's it.